It’s 4:30 on this February afternoon and most of my friends are thinking about leaving work, driving home, or starting to make dinner. I walk over to my upstairs window, looking at the sky to see if there are any high clouds. Should I stop working right now and quickly drive to the beach to enjoy a beautiful sunset? I look at my tide watch to see what the tides are doing – the lower the tide, the better the reflections are for photos at sunset. The best tides are the extreme negative low tides that come in winter as they can create mirror images of the clouds above or any structures – such as piers – nearby. The sight of some really high, wispy clouds makes me turn off my computer and grab my camera gear. The closest beach for me is the ‘River Jetties’ – right on the border of Huntington Beach and Newport. Street parking on the Newport side is free and plentiful in winter. I love that dogs can run free on a very small strip of County beach that is sandwiched between the areas that prohibit unleashed dogs at Huntington State Beach and Newport Beach. Seeing the exuberant group of playful dogs silhouetted against a pink or orange sky with the dark outline of Catalina Island on the horizon is a great way to end the day! From about October to March, Southern California residents are blessed with many spectacular sunsets over the ocean. As the winter sun sets behind Catalina Island, the sky lights up the atmosphere and any clouds that hover above. One secret to capturing the best reflections in shallow water is to get down as low as possible. Sometimes this means getting very sandy or even wet, but it is worth it once you get home and see your photos. Even with today’s ‘image stabilized’ lenses, it is best to use a tripod or monopod to get the sharpest images in low light conditions. Although not as stable as a tripod, I prefer a monopod as it allows me to move around easily to compose shots from different angles and it can quickly be raised or lowered. Once you set up a tripod, it is hard to move around. Wait for each wave to recede to get the mirror images at low tide. And, if it is safe for you and your camera, wade into the shallow water for a different angle, so be prepared with appropriate footwear or go barefoot. Including a focal point of interest in the foreground such as a tree, bird, dog, surfer, boat, lifeguard tower, pier, or even people can enhance your sunset photos. Don’t be afraid to experiment with your camera settings to get different effects such as using a slow shutter to get a blurry image, use backlight settings, vertical vs. horizontal formats, etc. Investing in an inexpensive ‘remote shutter release cord’ also helps to eliminate the slight movement that occurs when your finger presses the shutter on the camera. It is easy to make the mistake of leaving the beach too early and missing out on the most spectacular explosions of color. I have done that far too many times and it is heartbreaking to look in my rear view mirror only to see the whole sky ignite in a burst of color! So, always stick around a few minutes beyond the point where you think the sunset is over. I often call my friends and mention that I think there is going to be a nice sunset and many of them are puzzled as to how I know that. Pay attention to the hints, beginning with the sunrise. Many times when we’ve had a beautiful sunrise, it is followed by a stunning sunset. Watch the clouds throughout the day – sunsets are always more dramatic with clouds. When we have had Santa Ana winds blowing through the day, the pollution blows out over the ocean and can result in very colorful sunsets. Recently we had a thick fog all afternoon and I gave up on it clearing in time for the sunset so I started driving home. Only a few blocks away, I looked back towards the ocean and the fog had suddenly lifted and all the moisture in the air created the most spectacular sunset. And, if you have a hungry family at home that isn’t impressed with you racing out the door instead of making dinner, my secret weapon is to throw some meat in a slow cooker early in the day. That way, dinner is ready when you come in all wet and sandy and raving about the amazing sunset photos you just got! Anyone who is married to or spends a lot of time with a surfer is likely a victim of “surf affliction”. Most surfers only surf when the waves are good. That means they don’t surf when the waves are bad or marginal, which unfortunately is the majority of the time. This is why surfers HATE committing to anything too far in advance, because it just might be the ONE DAY all week, month or year that the surf is firing. If there is a fun sized, offshore day that happens to coincide with the day you promised Grandma you would help her clean out her garage, there are going to be some tears flowing. Events like your own child’s birthday parties, your child’s soccer team playoff final, your sister’s wedding – heck, your OWN wedding – are almost always going to turn out to be the best surf days of the year. You can count on it! This is why surfers rarely fully commit to anything and they get in a lot of trouble for it. Surfing can cause many problems in families and relationships. Non-surfer wives have a hard time understanding a husband’s hesitation to commit to going to the in-law’s house for an all-afternoon bar-b-que. He’s going to get the stink eye if he sneaks out to have a quick session instead of making sure the car is ready for the long drive, let alone helping load the car and getting the kids ready for the family outing. Only a surfer fully understands this dilemma. As a pro surf photographer, I am as bad as the surfers. I learned a long time ago that there is no point in wasting my time shooting surfers in 2 foot whitewash. Most guys are annoyed that they even had to surf that slop – they certainly don’t want a permanent 8 x 10 glossy reminder of it! So, if I actually rely on shooting surfers to pay my bills, I pretty much have to keep my calendar very fluid so I am available to shoot when the surf is good. You have no idea of how annoying my unwillingness to commit to invitations has become to my friends. A friend calls up and asks if I want to go to lunch next Wednesday. I try to stall while I run to my computer and quickly log onto Surfline to see what the long-range surf forecast looks like for the middle of next week. 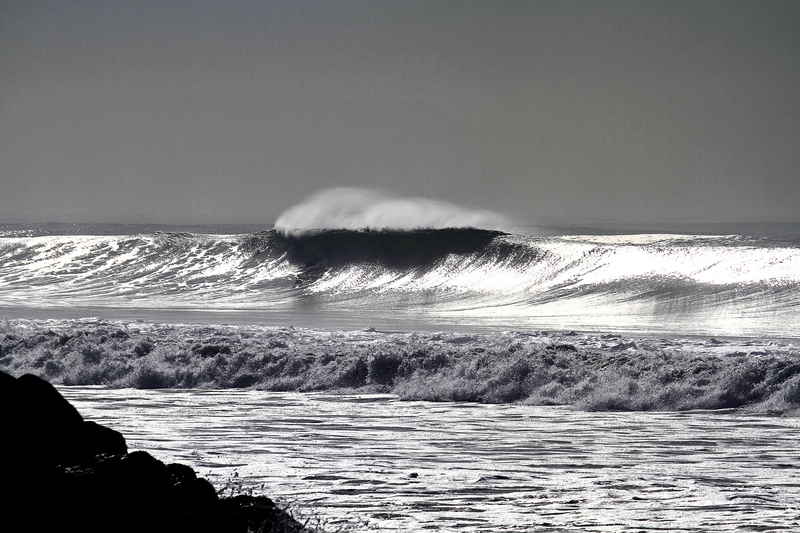 Darn, the swell is building all afternoon Tuesday and is forecast to peak at noon on Wednesday! So, I suggest that we meet on Monday, but then I start remembering how big swells have a tendency to arrive a day or so early and those little windows are usually the best conditions. My friend counters by suggesting lunch on Thursday – darn, I know that once the long period swell starts to back down on Wednesday, the interval will shorten and that will make one of my favorite surf spots go off on Thursday. How many ums and ahs can I get away with as I try to suggest that maybe we should postpone our lunch to the following week? And so, we pencil in a date for the following week. I wake up on Wednesday and there is a pea soup fog so I quickly call my buddy and tell her “my plans were cancelled at the last minute” and see if we can squeeze in that lunch after all. Nothing shuts down a surf photo shoot faster than a fog rolling in. And, surfers love it that every spot becomes a ‘secret spot’ in the fog. Other days, I wake to a dreaded south wind and know that most local spots are going to be blown out, so I get out my ‘to do’ list or clean toilets. I have learned to make the most of ‘non surf’ days so my days are clear when the surf gets good again. Herein lies the secret for keeping life in balance – be super organized and productive when there is no surf so you can afford to drop everything when the waves are calling your name. One of my favorite things to do is volunteer my time to photograph surf events for charity organizations that put on surf days for children with special needs, people with spinal cord injuries, amputees, foster kids, etc. These events are planned out months and sometimes even a year in advance. So, I have to commit way in advance and they are counting on me to be there to take photos. Sure enough, we’ll have a lull of 3 weeks with absolutely no surf and then a huge, perfect swell arrives on the same day as my volunteer shoot. Suddenly the “value” of my donated time goes way up because I have now sacrificed my only chance to make some money all month in order to fulfill my volunteer commitment. Luckily I get a lot of joy from volunteering for these events, and luckily my family does not rely on my surf photography income, but not all surf photographers are as fortunate. The other situation surf photographers find ourselves in is surf overload when we get back-to-back swells. Surfers paddle out and surf for a few hours and then go home and mow the lawn or go back to work, etc. – their “work” is done. After shooting for a few hours at 8 frames per second, I go home and spend the next 8 – 12 hours or even several days dealing with thousands of photos. Just scrolling through them and deleting the bad ones can easily take an hour or more. Then uploading, coding by surfer, sorting the best ones, backing up, etc. takes a few more hours. Editing is the most time consuming part of the job, but it is where the artist in me gets satisfaction. I can’t bring myself to post unedited, junky shots on my website. I believe that my reputation is only as good as my worst photo that’s been posted. And so, I edit when I should be sleeping. Strangely enough, I am nearly as stoked as the surfers I watch while capturing their best waves. And, I actually enjoy re-living each wave at my computer as I sit editing at midnight. If we have day-after-day of firing surf, I get very little sleep. If I edit into the wee hours of the morning so my clients can enjoy seeing their shots as soon as possible, it’s going to be very painful for me to set my alarm for a dawn patrol session the next morning. However, the lure of great waves and great conditions always wins out and I often get talked into shooting a few days in a row. But, this comes at a very high price in that I have to drop everything else in my life. This is where my crock pot comes in handy and ensures that my family gets dinner at a reasonable hour – I just throw in a roast as I head out the door for an all-day surf safari. My favorite thing is turning on my cel phone each morning and hearing the text alerts going off by the dozen when the surf is firing. I love receiving eyewitness surf reports from my most reliable surf buddies, up and down the coast. Those morning reports help me decide where the surf is best for shooting that day, so I don’t waste my time driving from spot to spot as the optimal lighting is lost. What can I say? I suffer from a bad case of Surf Affliction and, if anyone knows of a good one, I need a 12-step program to get over it!